After falling in love with the idea of Japanese Milk Bun Pandas over at Bento Monsters, I tried making black & white animal rolls last week, and the end result wasn’t as good as I would have liked. Today, though, I tried using the Chebe bread mix, and it turned out beautifully! I especially like the white tiger. Unlike many of my posts, today’s two lunches (G3 has a half day) don’t match at all. G1 has a hot and cold lunch, and G2 has another My Little Pony lunch. The trick I learned from a pin on Pinterest is how to use the iPad/iPhone app “Camera Lucida” to draw on food. G2’s lunch is based on the My Little Pony cutie mark cupcake G2 had made this past weekend. Today’s pony is “Derpy Hooves”, a grey pony with bluish bubbles as a cutie mark. I wasn’t able to make grey easily at all, so she turned out much closer to black. Other than the pony being too dark, I’m rather proud of myself. the Camera Lucida app makes it so much easier to draw ponies! In her Easy Lunchbox G2 has Havarti with caraway seeds and homemade MOMables-inspired gf crackers, each in a silicone heart cup. Her Derpy is made using provolone cheese, a MLP cookie cutter and food coloring and food safe markers. At the top right she has baby carrots and a CuteZCute rainbow star container filled with hummus. At the bottom right is a chocolate cupcake with Derpy’s cutie mark on it. G1’s hot & cold lunch is in her Totoro Bento Box and a Thermos. Her Thermos is filled with hot tomato soup with a bit of oregano and basil sprinkled on top. At left in the upper, vented section of her Totoro Bento Box is a clementine and two gluten-free oatmeal chocolate chip cookies in a silicone heart cup, plus a snowflake food pick. In the bottom, sealed section of the bento are two cold snowmen cut out of tofu and decorated with food safe markers, with a snowflake for decoration. This post is linked on What’s for Lunch Wednesday and Fun Food Friday. We go to dinner once a month at our friends’ house, and we eat with them and our church’s missionaries. It’s wonderful – we really enjoy the time with our friends and the missionaries, plus my youngest daughter is BFFs with our friends’ daughter. We alternate who brings the entree, but we always bring the dessert. We do this partly because gluten-free desserts can be tricky, but also because G2, G3, and I love to bake. G2’s lunch matches a leftover cupcake. In her Easy Lunchbox she has Twilight Sparkle painted on provolone cheese, with details in food coloring and food safe markers. She also has Havarti cheese in a silicone heart cup and homemade MOMables-inspired gf crackers in a mini silicone cup, with heart mini forks. At the top right she has a clementine with a heart mini fork, and a Twilight Sparkle cupcake. In a Snoopy Bento Box she also has a penguin roll. G2 has a Thermos filled with chicken and rice soup. To go with that she has a Snoopy Bento Box with a white tiger bread roll. I’ve also put a Rarity cupcake in her Snoopy Bento Box along with her roll. G3 also has two Laptop Lunch Bento Buddies containers. One is filled with chocolate pudding, and the other with orange smiles and heart mini forks. She also has one more container with orange smiles for snack, but that one didn’t fit in the picture. G1’s lunch is simple. I packed the last piece of lasagna in her Thermos, and she’ll be sad to not have any more tomorrow. As a bonus part of her lunch she has a panda roll. Plus, in her Snoopy Bento Box she has two oatmeal chocolate chip cookies in mini silicone cups, and a clementine with a heart mini fork. I don’t quite know how these days are determined, but I was told that December 4th is national Rainbow Dash Day, so I made Rainbow Dash lunches for my two My Little Pony: Friendship is Magic (MLP:FIM) fans. After I made these My Little Pony lunches, and was criticized for not having a proper MLP cookie cutter, I found a really cool 3D printed My Little Pony cookie cutter on etsy. Today’s lunches are based on Rainbow Dash, with the exception of G1’s panda lunch. G3 has a good lunch today. Not pictured is her Thermos filled with chicken and rice soup. In her Snoopy bento box she has a snack of S’morables gluten-free graham crackers and half of a Honeycrisp apple, with a couple homemade Snoopy food picks. In her Easy Lunchbox she has a couple slices of Mozzarella cheese cut into Rainbow Dash’s shape, with appropriate details drawn using food-safe markers. Mozzarella works very well for this, much better than provolone. I added some fairy & unicorn stickers, as well as a Lunchbox Love Christmas note, both of which are packed in plastic sleeves to protect them from lunch ickiness. In the side sections of the Easy Lunchbox are the other half of the Honeycrisp apple and a cupcake-sized gluten-free chocolate chip cheesecake with a molded chocolate star on top. I added some alphabet food picks to spell most of Rainbow Dash’s name. G2 doesn’t technically have a school lunch today – she has a tour at a private high school, and will be arriving at school just after lunch. I’m sure I’ll get her some type of little treat, but I wanted to let her have a little bit of a Rainbow Dash lunch, especially because she’s the one who let everyone know about Rainbow Dash Day. She also had orthodontic work done yesterday, and she wants soft foods, so she doesn’t have any crunchy fruit in her snack/lunch. In her Easy Lunchbox, G2 has 2 slices of provolone cheese cut into Rainbow Dash’s shape, and decorated with food-safe markers. In the top right section she has a chocolate chip cheesecake with a chocolate star on top. Finally, I used some alphabet cookie cutters to write Rainbow Dash in American cheese. Despite the best efforts of her sisters, G1 isn’t obsessed with MLP:FIM, so she had another panda lunch. This is my go-to theme for her, especially when her sisters are getting something time-consuming! G1 also went to the orthodontist yesterday, so she has mostly soft food – she has some tomato soup in her Thermos, and also has treats in her Totoro Bento Box. On the left, in the bottom, sealed container, are tofu pandas made using the CuteZCute animal palz press and the CuteZCute panda cookie cutters. In the vented top section on the right some carrots & celery and a little bunny container filled with Ranch dressing with a panda food pick. She also has a gluten-free chocolate chip muffin and a few little fresh Mozzarella in a silicone heart cup, both with some other panda food picks. I added a Lunchbox Love Christmas note just for fun, too. I’m waiting to hear how lunches are received at school today! G2 and G3 peeked, and they were so happy! 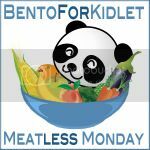 This post is linked at What’s for Lunch Wednesday, Bento of the Week – Anything Goes, and Fun Food Friday. I believe I’ve mentioned here before that G2 is the child who most likes to bake. She loves to decorate cupcakes and cakes, and loves to show off all her baking. G3 likes to help with things, but she’s not yet at the stage of being able to bake all on her own, though she does really like to decorate – especially with fondant. Well, last night G1’s church class did cupcake decoration. She was so excited to come home and show off that she can decorate, too! I was happy to see her start to show an interest in some type of cooking or baking, as anyone with Celiac Disease needs to know how to cook in order to survive. We’ll see if she can move past cupcakes to meals at some point. G1 doesn’t usually get the in-depth, tricky lunches, probably because she’s 15 and doesn’t ask for them. This time, though, I tried to make Totoro for her, after having previously seen some Studio Ghibli bentos. Today in her Easy Lunchbox, she has a Totoro made out of tofu. I used 3/4 of a circle cutter for Totoro’s body, and a Pikachu head to cut his head. The decorations are made out of nori and soy paper (I’m including the Amazon Affiliate link for the soy paper, but I found it for half the price at Whole Foods), all cut freehand. In the top sections of her ELB are carrots with a heart food pick and one of the cupcakes she made. In a separate Lock & Lock container, she has some pineapple chunks and a lion food pick. She also has a Thermos of tomato soup. G2 has been working really hard at school, and also really likes having fun and being silly. While the unicorn cookie cutter I have doesn’t look at all like a My Little Pony, it was all I had to use as a template. I just found an etsy shop filled with MLP cookie cutters made using 3D printing technology. Very cool! In G2’s Easy Lunchbox today, she has 2 provolone sandwiches decorated to be Rarity and Sweetie Belle from My Little Pony: Friendship is Magic. In the top section on the left she has a chocolate cupcake with fudgy icing decorated with a crown and a bow food pick. On the right she has sliced apples (dipped in pineapple juice leftover from G1’s lunch to keep from browning), and in her ELB mini-dipper she has cinnamon sugar. We’ve found that apples get gooey and gross if the cinnamon sugar just sits on them all day, so instead I put the cinnamon sugar in a separate container. G3’s lunch is pretty similar to G2’s, though she’s much more critical about the fact that the unicorn cookie cutter doesn’t look like a My Little Pony. She has a Thermos filled with homemade chicken noodle soup, plus a Laptop Lunchbox with extra goodies. I put in a slice of bread with cheese decorated to be Rarity. She also has a regular-sized cupcake and a mini cupcake, both decorated with a crown and a bow food pick. She also has apples carved like bunnies, with a little heart food pick for fun. 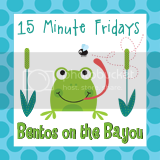 This post is linked at What’s For Lunch Wednesday and Fun Food Friday.